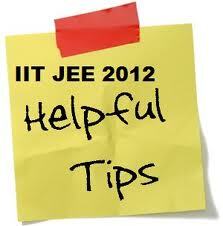 Tips For IIT JEE Examination 2012, Tips For IIT JEE Examination 2012 How to Prepare, It is always a good idea to start preparing for IIT-JEE at the very beginning of 11th standard. Do`s and don’ts for the exam and success secrets. • It is always a good idea to start preparing for IIT-JEE at the very beginning of 11th standard. This helps save time and moreover relates a lot of stuff to the already existing material for board’s study. • Never follow or go for coaching’s just because one of your friends is doing so and you need to. • Believe in yourselves and work hard. • There is no shortcut to success. • Do not miss a portion of the syllabus. • If you have started your preparation late then it is always a good idea to cover minimum 80% of the total course and be thorough with it instead of trying of to study the entire curriculum. • Incorporate difficult topics if you already have a sound understanding of them. • Make sure that you use the right reference and study material as it can make a tremendous difference to your scores. It is recommended to study from the books which contain numerous solved questions. Focus on the method of solving the problems. • There is no scope for rote learning in IIT JEE. • Be very sure of your concepts, if not spend days to solve a problem but work out a reason for it. • Spend the initial few months in revising the basic concepts learnt in standard 9th and 10th basic books and NCERT fundamentals. • At the time of examination start solving the questions as soon as you receive the paper. Do not scan the paper and mark the questions you simply waste time. But do not devote excess time with a question if you are not able to solve it. • Maintain your confidence level at time of exam.